Welcome to Down On The Street, where we admire old vehicles found parked on the streets of the City That Rust Sorta Ignored: Denver, Colorado. 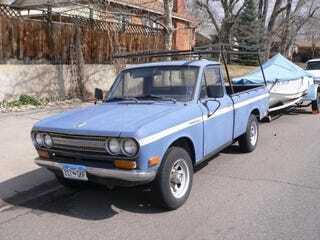 You still see surprising quantities of these old Datsun trucks getting the job done today. While the world's warlords and strongmen tended to go with Toyota trucks when it came time to haul their troops across the desert or jungle back in the early 1970s, the Nissan 521 was just about as reliable. This boat-towing Datsun still works hard at age 39.